The beat flows through the Donnington Grove Hotel ( and golf course) grounds outside Newbury. The hotel General Manager, Christopher Strong, beautifully spoken and adorned rurally in corduroys and magnificent red socks, greeted me warmly, thanked me for visiting and helpfully informed me where best to park, and access the stream. 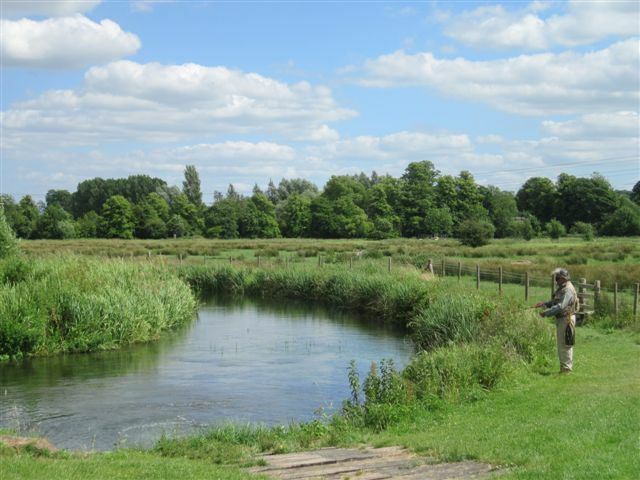 It is rarely more than 15 feet wide, and casting is tight with overhanging branches, and bank side vegetation, in plenty, to catch the wayward. The stream is crystal clear and flows over a stony bed with plenty of weed for cover. Some staking work has been done to modify flows and create more. 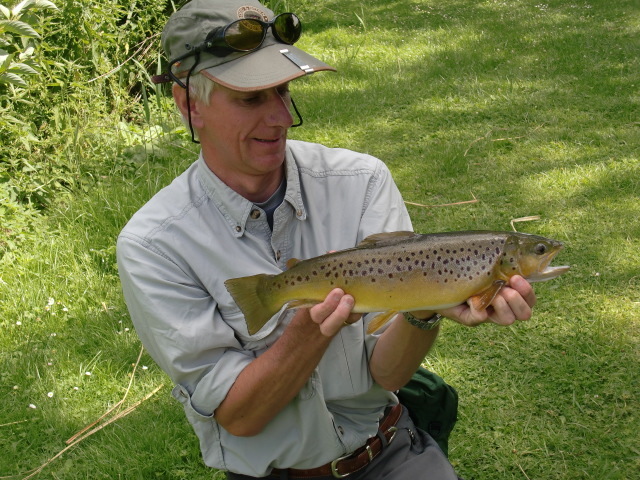 The stream is lightly stocked and in the bright sun of mid morning, my Cul du Canard (olive) produced two stocked fish, and five wild browns. After clouds covered the sky, the temperature dropped and the fish stopped feeding as the barometer fell. The beat is delightfully challenging, and one has to be a little wary of hooked golf balls, some of which littered the bed a hundred yards upstream of the bridge. 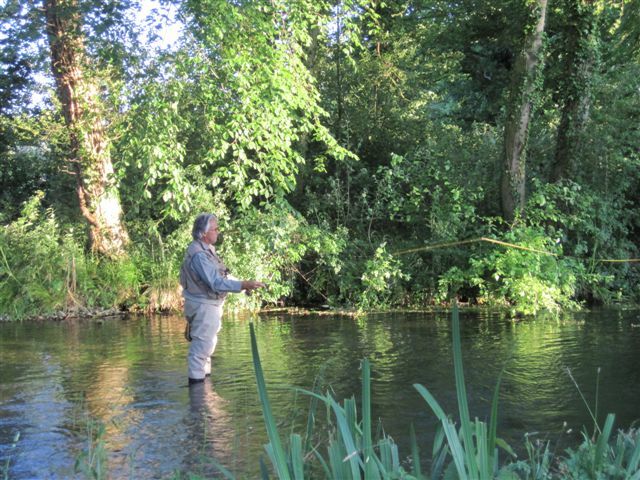 I could really love the Lambourn….it is a gem of a small chalkstream, and in many respects, more fishy, and more delightful to be on than some of its grander Wiltshire cousins. Well return to Barton Court I did, on the occasion of Iain (Sorell’s) visit from Connecticut for the British Grand Prix, where hopes were high for a McClaren and British one-two, in the guise of Jensen Button and Lewis Hamilton. You know that did not happen, and in any case, some Berkshire trout were more important. The river on our visit was in good order, but it seemed the only fish taken then and in previous days, were to nymphs. Right by the bridge off the car park, there were several browns sunbathing adjacent to low hanging branches, and I tried what every visitor must to appeal them, but I have never seen such dismissive arrogance as they gave me, and I withdrew! But to the run just below them where the sluice has scoured out the deepest pool and back eddies, and some lunkers (an American expression used to describe large mouth bass!) could be seen feeding several feet down. And a couple of casts later a 5lb rainbow succumbed to a PTN. Tough blighter, but a greedy one which had probably been caught before and was still too stupid to be unable to discriminate between the real thing and mine!! My goal was for Iain to secure as much enjoyment from the Kennet as he gave me on the Housatonic and the Farmington, so my task was more to guide. It was nevertheless a quiet day (only another rainbow, and a perch came to our nets), but we took the opportunity to explore the whole fishery, and this revealed the beauty of its carriers.